The volleyball team failed to win a set over the weekend as it hosted conference foes Duke and Wake Forest at the O’Keefe Gymnasium. The weekend began with a televised matchup on Friday night that the team lost 3-0 to the No. 24 ranked Blue Devils, followed by a Sunday afternoon clip against the Demon Deacons that also ended 3-0. The losses extended the team’s losing streak to five games, dropping the Jackets to a 7-13 overall record, with a 1-7 record in the ACC. The team has not won a set since the first set of the Oct. 5 matchup vs. Miami. The Blue Devils came into Friday fresh off of a ten game winning streak, and it showed against the Jackets as they took the game in three sets, 25-21, 25-21, 25-20. Tech took the first four points of the game to take an early lead, and was still leading by three in the middle of that first set. However, Duke took the lead for good with a five-point run highlighted by two service aces to take the first set. The second set was not as close as the score indicated. Duke took the lead early and never looked back. The Jackets were forced to play catch-up but were unable to stop the momentum of the Blue Devils despite a late surge. The third set was more hotly contested, where every score by one team was seemingly matched on the following volley to keep the score tied. Then, with the score tied at 15, Duke went on a 7-1 run to put the set—and the match—out of reach. The team has not won a set since the first set of the Oct. 5 matchup vs. Miami. Jennifer Percy led the team with nine kills and ten points on the match, while London Ackermann had a team best 12 points. Kaleigh Colson contributed 14 assists. 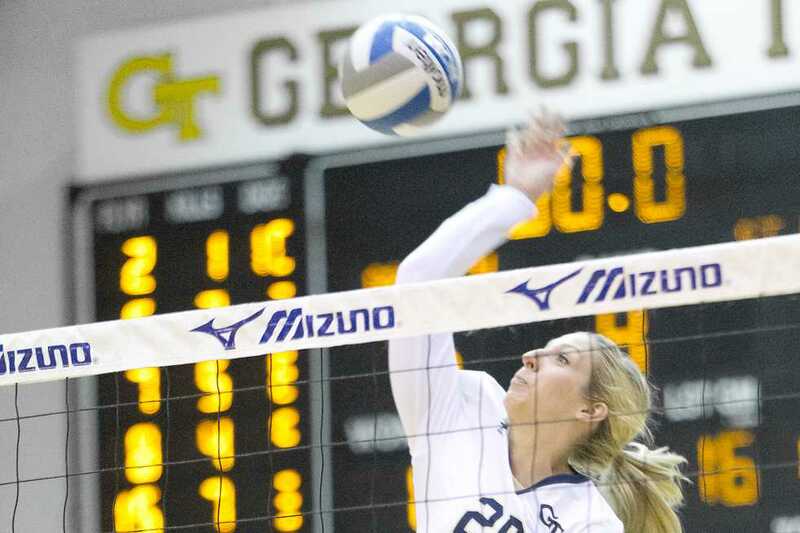 The Jackets came out firing on Sunday against the Demon Deacons, rolling to a 12-3 lead in the first set. Wake Forest responded with a 13-4 run of their own to tie the set at 16, and from there the teams traded blows and sent the set into sudden death. Kills by Courtney Felinski and sophomore Chanell Clark-Bibbs put the Jackets at set point, but they were unable to capitalize as Wake Forest went on a three point run to take the first set, 29-27. The set featured eight tie scores and seven lead changes. Set two began as closely as the first one ended, with both teams trading punches to bring the score up to 15-14 in favor of Wake Forest. Then fatigue set in for the Jackets, with four straight attacking errors, and a service ace blew the Demon Deacons out to a 20-14 lead, which they were able to maintain to win the set, 25-17. It was a similar sequence for the third set with the teams tied in the middle before the Demon Deacons simply outlasted the Jackets to win the match, 25-19. Percy was the team leader in kills and points again with 11 and 12, respectively. Callie Bivings notched 25 of the team’s 35 assists, while Ackermann and Ivona Kolak each put up 14 digs. The team now travels north to face ACC newcomer Syracuse on Friday night, followed by a Sunday afternoon match at Boston College. Boston College will be looking to pick up their first ACC win of the season.